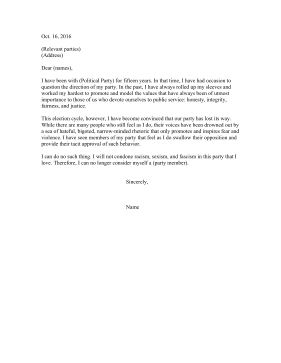 If your political party has departed too much from your beliefs and ideals, use this resignation letter to let fellow members know that you'll be supporting other candidates in the upcoming election. I have been with (Political Party) for fifteen years. In that time, I have had occasion to question the direction of my party. In the past, I have always rolled up my sleeves and worked my hardest to promote and model the values that have always been of utmost importance to those of us who devote ourselves to public service: honesty, integrity, fairness, and justice. This election cycle, however, I have become convinced that our party has lost its way. While there are many people who still feel as I do, their voices have been drowned out by a sea of hateful, bigoted, narrow-minded rhetoric that only promotes and inspires fear and violence. I have seen members of my party that feel as I do swallow their opposition and provide their tacit approval of such behavior. I can do no such thing. I will not condone racism, sexism, and fascism in this party that I love. Therefore, I can no longer consider myself a (party member).